If you are in London on September 29, why not take the opportunity to attend a concert to help raise funds for two fantastic charities, the Donor Conception Network and the Daisy Network. Taking place in St Mary’s Church in Rotherhithe, the concert is with Dunajska Kapelye, a trio who play beautiful gypsy and Eastern European music and are led by one of London’s most respected violinists, Polish Piotr Jordan. 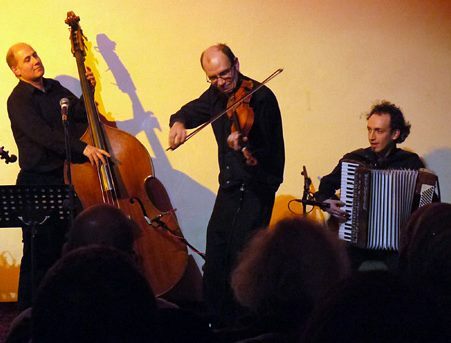 The concert will feature plaintive Gypsy ballads, tub-thumping Romanian wedding dances, elements of tango and klezmer. It promises to be a wonderful evening – and great to be able to be raising money to support such important charities with their work at the same time. This entry was posted in infertility and tagged Daisy Network, donor conception network, Dunajska Kapelye, fertility, infertility, Piotr Jordan, Rotherhithe, St Mary's Church Rotherhithe by fertilitymatters. Bookmark the permalink.